The property is located in the historical centre of Venice in the area of Rialto (few steps to famous Rialto bridge) and a short walk to St Marks Square. It is located on the 3rd floor of a Venetian building and it is composed of 1 bedroom, living room with kitchen and large sofa, small panoramic equipped terrace overlooking the rooftops. Very attractive flat in characteristic and typical location in the Rialto quarter. You can easily walk to main historical and interesting places of the city from this location, but far from noisy tourist quarters. The flat is located in the central area of Rialto (the famous bridge crossing the Grand Canal, main water way of the city) right in the heart of Venice . A very good location to walk everywhere to the main sites. The flat has a small terrace with table and chairs with a nice view on the roof tops of Venice. This is the oldest bridge and spans the Grand Canal. It probably dates back to 1172 and was originally in wood. In 1557 the Venetian Republic put out a tender for rebuilding the bridge in stone. The architects who competed for the tender includes Palladio and Sanmichieli. The tender was awarded by Antonio da Ponte and in 1591 the bridge was inaugurated. Perhaps the oldest church in Venice. It is still laid out in the form of a Greek cross. Opposite, we have the 'Gobbo di Rialto' which was built by Pietro da Salò in 1541. Next to it, there is the 'Pietra del bando' from which the decrees of the Venetian Republic were read out. This was the commercial heart of Venice, where merchants met to hammer out their agreements and where the Banco Giro was located. This bank was already in existence in the twelfth century and enabled credit to circulate San Polo Square. It gives its name to the district. The bathroom is located near the bedroom, it has a large, full of light window, washing machine is available. fridge/freezer, hob, microwave and sink. Great location! Very comfortable apartment! Perfect location for visiting Venice. Very close to Riolto Bridge- walking there in 5 minutes. Very comfortable, everything you need, and spacious! Loved the high wooden ceilings! Bathroom modern and updated and bed very comfortable! Perfect for a romantic stay in Venice. Plus a balcony to enjoy all the church bells ringing! The homeowner was great to get in touch with and gave us pointers on how to get around Venice and restaurants. Awesome! Book this...you will love it! Nice large apartment at the top of the building, perfectly situated with a great host. Apartment is in a great location, just a few minutes walk from the Rialto Bridge with plenty of shops and restaurants nearby. We arrived early so Paola wasn’t there to greet us but the cleaning lady was very nice and allowed us in to drop the luggage, gave us the keys and that allowed us to go out to lunch and start our visit until we were able to meet with Paola a bit later that afternoon. She’s a really lovely lady who was very friendly and had some recommendations for places to eat which we ended-up trying out. The Osteria Bea Vita on her list was also on our list we researched before the trip and ended-up being a great little place with tables right next to a canal in the Cannaregio area a bit away from the main stream. We would recommend this apartment & would definitely stay there again on a future visit. 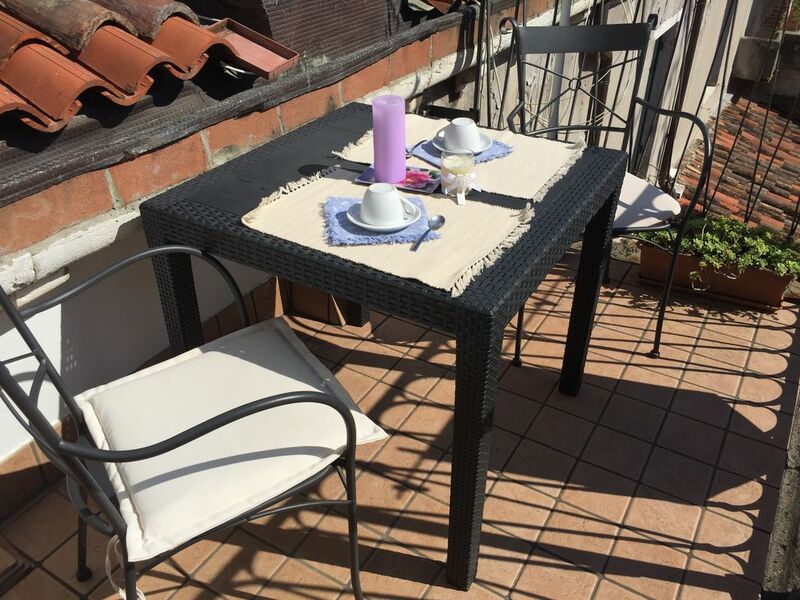 Apartment is in a great location, just a few minutes walk from the Rialto Bridge. Paola was there to meet us and is a really lovely lady who was extremely helpful & friendly. The apartment itself was beautiful & extremely well stocked with everything you could possibly need, it was well worth climbing all the stairs for ! We would recommend this apartment & would definitely lobe to stay there again. thank you for choosing my flat , I am very pleased you liked it and hope you spent a nice week in Venice. Paola gave us a warm welcome and showed us round the lovely apartment tucked up under the eaves. We found it comfortable and clean, well kitted out and with very useful air conditioning. We were delighted with the little balcony and the views of St Mark's Campanile to the south and the Basilica of Santa Maria Gloriosa dei Frari to the west, just visible across the red pan-tiled roofs and chimney pots all. The apartment is in a great spot, very quiet but close to the Grand Canal, with the fish market, the fruit market and plenty of little shops and restaurants close by. We thoroughly recommend this apartment, and intend to return next year! Wenn du dem Himmel nah sein willst, dem Himmel und Venedig, dann musst du bei Paola wohnen. Da oben unter dem Dach mit Balkon und Fenstern rund herum, hell und sonnig, fühlst du dich wie im Paradies, wenn Venedig an sich überhaupt noch eine Steigerung zulässt. Hier über dem alten Fischmarkt findest du auf mehreren Ebenen alles, was du zu deinem Glück brauchst und unten auf dem Fischmarkt sowieso. In Rialto Mercato bist du mitten im italienischen Leben. Sogar die Möwen beteiligen sich am Frühstück und der Campanile ist so nah, dass man ihn greifen könnte, wären da nicht die Schleifen des Canale Grande. Also, es gibt gar keine Wahl, ihr müsst Paola besuchen, nur nicht zu der Zeit, wo wir in diesem wunderschönen Appartement glücklich sind!